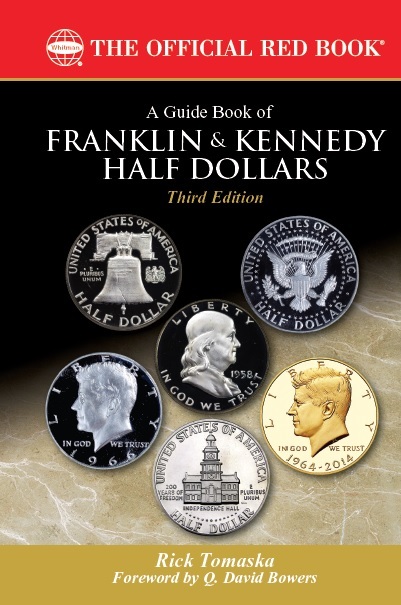 (Pelham, Alabama) — Whitman Publishing announces the release of the updated and expanded new third edition of A Guide Book of Franklin and Kennedy Half Dollars, by professional numismatist Rick Tomaska. The 320-page book will be available from booksellers and hobby shops nationwide on May 8, 2018, for $19.95. Before then it is available for preorder (including online at www.Whitman.com). Franklin (1948–1963) and Kennedy (1964 to date) half dollars are two of the most popular series in modern U.S. coinage. “Collectors can enjoy challenges and rewards with these coins whether their hobby budget is $50 a month or $50,000,” said author Tomaska, who provides pricing in multiple grades for each coin. In addition to sharing behind-the-scenes knowledge of the retail and auction markets, Tomaska gives the history of their designs, production, and other technical and cultural aspects. He explores transitions in Mint craftsmanship and reveals why Franklin and Kennedy half dollars represent the end of an era. He studies the coins date by date with commentary on exceptional and highly toned specimens, describes how Proof coins are made and graded, and teaches about Cameo and Deep Cameo contrast, Full Bell Lines, certified coin populations, and other factors important to value and rarity. Collectible die varieties, tips for smart buying, and hundreds of full-color photographs round out the contents. The third edition has been expanded by more than 10 percent, to 320 pages, with no change in its retail price of $19.95. New features in this edition include record auction and retail prices; coverage of the 1964–2014 gold and silver Kennedy half dollars; and new illustrated appendices on “Exceptional Cameo Contrast” and remarkable error and misstruck Franklin and Kennedy halves. In addition, Tomaska has included an illustrated chapter on Proof Liberty Walking half dollars, which he describes as “true classics born during the wonderful Renaissance era in American coin design” and as precursors to the Proofs of the Franklin series.